B'resheet/Genesis 40:12 And Yosef said to him, "This is the interpretation: three branches are three days ..."
These are the words of Yosef, spoken in prison to Pharaoh's chief cup-bearer as Yosef shares the interpretation of the latter's dream. It comes in the middle of verses 9-19, the telling and interpreting of the dreams of the chief cup-bearer and the chief baker, both consigned to prison for offending Pharaoh in some way. The verse are framed by the start and end of the chapter, setting up the context - Yosef is looking after these high-ranking but currently out of favour courtiers in prison - and relating the fulfillment of the dreams according to the interpretation Yosef has given. Abravanel doesn't want anything taken away from the miraculous, insisting that "G-d inspired Yosef and it was not as a consequence of his own human wisdom or interpretive powers." Certainly the ancient commentators suggest a considerable number of interpretations or allegories for the symbols in the chief cup-bearer's dream: "The vine alludes to Israel; the three branches to Moshe, Aharon and Miriam; the blossom and grapes to the redemption and ripening of Israel" (B'resheet Rabbah 88:5). On the other hand, "Rabbi Eliezer says: The 'vine' is the world, the 'three branches' are [the patriarchs] Abraham, Isaac and Jacob; 'and as it was budding its blossoms shot forth', these are the matriarchs; 'and the clusters thereof brought forth ripe grapes', these are the tribes ... Rabbi Joshua said: The 'vine' is the Torah, the 'three branches' are Moses, Aaron and Miriam; 'and as it was budding its blossoms shot forth', these are [the members of] the Sanhedrin; 'and the clusters thereof brought forth ripe grapes', are the righteous people of every generation ... Rabbi Eleazar the Modiite says:. The 'vine' is Jerusalem, the 'three branches' are the Temple, the King and the High priest; 'and as it was budding its blossoms shot forth', these are the young priests; 'and the clusters thereof brought forth ripe grapes', these are the drink-offerings" (b. Chullin 92a). 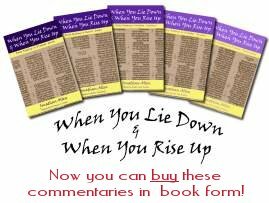 HaShem through the dreams and the interpretations that Yosef provides. Our first example comes from one of the earliest written prophets, Hosea: "Come, let us turn back to the L-RD: He attacked, and He can heal us; He wounded, and He can bind us up. In two days He will make us whole again; on the third day He will raise us up, and we shall be whole by His favour" (Hosea 6:1-2, JPS). Writing to the northern kingdom of Israel (also referred to as Ephraim) in the years following 746 BCE, Hosea has outlined HaShem's case against Israel and rebuked them for turning away from HaShem not only in spiritual terms, to idols and pagan gods, but physically to the king of Assyria. Hosea warns Israel that HaShem has and will move to judge them. Then he urges Israel to repent, to turn back to HaShem, to trust in His healing and restoration. Israel will then be raised up on the third day and made well again. A second example come from the book of Jonah, written in the first half of the eigtht century BCE. Jonah was sent to proclaim HaShem's judgement against the city of Nineveh and almost immediately did the exact opposite, running away from the L-rd in the opposite direction. Caught in a storm at sea and identified by lots as the guilty party, Jonah instructs the sailors to throw him overboard in order to save the ship and themselves, at which point, "The L-RD provided a huge fish to swallow Jonah; and Jonah remained in the fish's belly three days and three nights" (Jonah 2:1, JPS). After three days, three days and three nights, a full seventy two hours and a lot of prayer and repenting, the fish spits Jonah out on the beach and HaShem re-commissions him to carry out His original mandate. The third example comes from the days of the Exile, while Israel is out of the Land. Israel's enemies are out to destroy the Jewish people and, through the person of Haman - a descendant of Amalek - the emperor of the Persian empire is hood-winked into signing their death warrant. Esther, a young Jewish girl who has become queen to the emperor hears of the plot to ethnically cleanse the empire of Jews and sends instructions out of the palace for her people: "Go, assemble all the Jews who live in Shushan, and fast in my behalf; do not eat or drink for three days, night or day. I and my maidens will observe the same fast. Then I shall go to the king, though it is contrary to the law; and if I am to perish, I shall perish!" (Esther 4:16, JPS). Why three days and not four; why not two? What is special about the number three? The Gospels bring together the phase "three days" and the idea of a sign in Yeshua's words to the scribes and Pharisees who were demanding a sign from Him to prove who He was: "An evil and adulterous generation seeks for a sign, but no sign will be given to it except the sign of the prophet Jonah. For just as Jonah was three days and three nights in the belly of the great fish, so will the Son of Man be three days and three nights in the heart of the earth" (Matthew 12:39-40, ESV). Notice that Yeshua doesn't say just "three days" but "three days and three nights" - the exact time that Jonah was inside the fish, a whole seventy two hours. This will be the only sign declared beforehand and performed openly in public as a proof or testimony of Yeshua's identity, mission and authority. In Mark's gospel, Yeshua makes it clear what will happen to Him - "He began to teach them that the Son of Man must suffer many things and be rejected by the elders and the chief priests and the scribes and be killed, and after three days rise again" (Mark 8:31, ESV) - but only says "three days", while Luke reports Yeshua using the phrase "on the third day": "The Son of Man must suffer many things and be rejected by the elders and chief priests and scribes, and be killed, and on the third day be raised" (Luke 9:22, ESV). This sign was performed exactly as written and as spoken from Yeshua's crucifixion and burial - three days and three nights - even giving Him time to proclaim the gospel to "the spirits in prison, because they formerly did not obey, when God's patience waited in the days of Noah" (1 Peter 3:19-20, ESV), until His resurrection on the first day of the week. But what does that have to do with Yosef interpreting the dream of Pharaoh's chief cup-bearer in prison? Remember the two disciples who left Jerusalem to walk to a village about seven miles away? They met a man on the road who asked them why they were looking so sad. "'Are you the only visitor to Jerusalem who does not know the things that have happened there in these days?' And He said to them, 'What things?' And they said to Him, 'Concerning Yeshua of Nazareth, a man who was a prophet mighty in deed and word before G-d and all the people, and how our chief priests and rulers delivered Him up to be condemned to death, and crucified Him. But we had hoped that He was the one to redeem Israel. Yes, and besides all this, it is now the third day since these things happened'" (Luke 24:18-21, ESV). It is now the third day; the women have seen the angels and the empty tomb, but the disciples don't get it. So Yeshua has to explain what is going on: "'O foolish ones, and slow of heart to believe all that the prophets have spoken! Was it not necessary that the Messiah should suffer these things and enter into His glory?' And beginning with Moses and all the Prophets, He interpreted to them in all the Scriptures the things concerning Himself" (vv. 25-27, ESV). Just as the cup-bearer and baker has to wait out the three days to confirm Yosef's interpretation, so the disciples had to wait out the three days to confirm Yeshua's predictions. Just like Jonah, Hosea and Esther, the third day came out right after all. Application: Are you like the cup-bearer or the disciples, waiting for the third day and wondering what will happen, or are you confident that you know both the story and the Storyteller so that there is no uncertainty? Make sure that you know on which side of the three days you are standing! 06:57 18Dec17 Judith Chesney: I remember when I first believed years ago, I would fast for three days often if I needed to know the way forward from the Lord. He led me to fast for three days when He wanted to make a situation clear to me. I always loved the three day expectation. Also important is the time when He said "Come let us return to the Lord. He has torn us and He will heal us. He has wounded us but He will raise us up. He will revive us after two days and on the third day He will raise us up and we shall live in His sight." Hoshea 6.2. Very exciting. Thanks for the encouragement!